The purpose of this website: helping you learn to play the piano. Building a strong foundation of piano-playing skills will lead to a lifetime of piano-playing joy. Reading Music: start with knowledge and then practice, practice, practice!! 3. Combine the notes and the rhythms, taking advantage of expertly written piano method books which are the most thoughtful and trustworthy resources for developing pianists. For direct links to these method books, as well as more thorough descriptions, see "Piano Music Books" . A plan for developing your music reading skills using these method books is detailed below under the headline "How To Practice Your Piano Music Reading Skills". Once you understand the basic elements, practice patiently, persistently, and consistently and success will follow. the Piano Skills Foundation series of piano lessons. The following exercises provide examples of the 4 most basic rhythm notes (quarter notes, half notes, whole notes, and eighth notes). 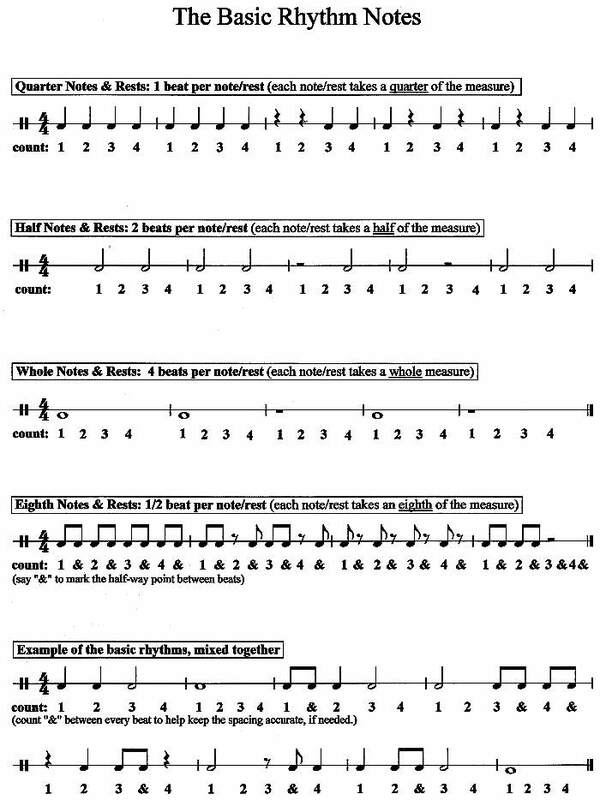 Try clapping these rhythms while counting out loud and keeping a steady beat (a metronome set at a slow tempo helps). Piano music combines rhythm notes like these with the notes on the grand staff. Once you are reading and playing at the piano, your rhythm skills will only develop if you are willing to count out loud for several levels. 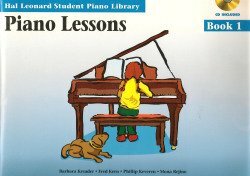 If you are a stark beginner and have no experience reading music, start at the beginning of the Hal Leonard Student Piano Library. Book 1 begins with "pre-reading", meaning it is for people with no music reading experience at all. 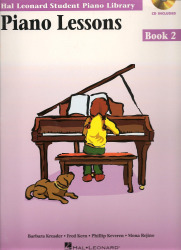 If you have had some experience reading music at the piano, but still consider yourself a beginner, you might consider starting with Book 2. Each level of this method book series (5 levels) has a "Lessons" book, a "Solos" book, a "Theory" book, a "Technique" book, etc... For just the reading music essentials, all you need are the "Lessons" and "Solos" books at each level. (The others are also helpful, but not as necessary). -If both hands are playing together (i.e. : there are notes in both treble and bass clefs at the same time), you must practice each hand separately, before playing 3x perfectly with both hands. -Use your metronome to help you keep a steady beat. Start at a tempo slow enough to allow the 3x perfect to be achieved within 5 to 10 attempts. 2. Once you've played each of 2 consecutive phrases 3x perfectly, play through both a few times (3x perfectly if you want). Then, work on the next phrase and continue the process until you have learned the whole piece and can play it through at a steady (and slow, at this point) tempo. 3. Use your metronome to help gradually increase the tempo up to the tempo indicated on the music. (In the Hal Leonard series, performance tempos are always noted.) Once you can play the piece at the top tempo, you can play it with the CD. -In the Hal Leonard series, each piece is played on the CD two times. The first performance is slower (a "rehearsal tempo"), and has piano playing along. The second performance is the faster "performance tempo" and has no piano part playing along. It's just you and the orchestra. This is not just a good music playing and listening experience, it's also fun!! -Once you can play the piece with the CD (and have done it many times), then you are ready to move on to the next piece. Make sure you do not move on until you play each piece easily and well. Follow these rules and you will be reading music successfully after a few years of practice. Do not follow these rules and you will never be a very good music reader. A guide to building a solid and complete piano-playing foundation. Return from "Reading Music" to "Home". Looking for some piano music? I have found Sheet Music Plus to be a fantastic resource for piano books & other materials. And they have instant digital downloads for thousands of individual pieces. 1. 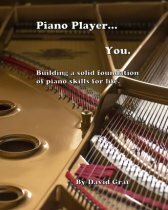 Buy the ebook, "Piano Player... You"
2. Purchase "Piano Skills Foundation"
If you find this website helpful, feel free to recommend and share it. "Nothing in this world can take the place of persistence. Persistence and determination alone are omnipotent. The slogan 'press on' has solved, and always will solve, the problems of the human race." "Nothing great has ever been achieved without enthusiasm." "If you think you can do something, or if you think that you cannot do it, you are right." "Joy does not come from what you do, it flows into what you do and thus into this world from deep within you." "I like honesty and sincerity; and I maintain that an artist should not be shabbily treated." "I do not have a single white note on my piano; my elephant smoked too much." "Outside of a dog, a book is man's best friend. Inside of a dog it's too dark too read."